The Dominion War is over. The Federation is at peace. What better time for two legendary starship captains to set aside the demands of duty and simply take some well-deserved time off? But when James T. Kirk and Jean-Luc Picard arrive on Bajor to dive among the ruins of an ancient sunken city, conditions are far from what they had planned. The small group of scientists the captains have joined suddenly find their equipment sabotaged—isolating them from Deep Space Nine and any hope of rescue—as one by one, a murderer stalks them. Cut off from the people and technology on which they have always depended, Kirk and Picard must rely on their own abilities, and their growing friendship, to solve the mysterious deaths and protect one of Bajor’s greatest living treasures. With time running out for a dying child trapped in the scientists’ camp, and Picard missing after a diving disaster, Kirk must search his memories of the past to relive one of his earliest adventures, propelling him into a harrowing personal journey that reveals his path from young Starfleet officer to renowned legend, and the existence of a new and completely unsuspected threat to the existence of all life in the universe. From the breathtaking shores of Bajor’s Inland Sea to the welcoming arms of a seductive and deadly alien commander intent on making Kirk her own, Star Trek: Captain’s Peril spans space and time to present Captain Kirk’s most personal, and most extreme, adventure. But when James T. Kirk and Jean-Luc Picard arrive on Bajor to dive among the ruins of an ancient sunken city, conditions are far from what they had planned. The small group of scientists the captains have joined suddenly find their equipment sabotaged—isolating them from Deep Space Nine and any hope of rescue—as one by one, a murderer stalks them. Cut off from the people and technology on which they have always depended, Kirk and Picard must rely on their own abilities, and their growing friendship, to solve the mysterious deaths and protect one of Bajor’s greatest living treasures. With time running out for a dying child trapped in the scientists’ camp, and Picard missing after a diving disaster, Kirk must search his memories of the past to relive one of his earliest adventures, propelling him into a harrowing personal journey that reveals his path from young Starfleet officer to renowned legend, and the existence of a new and completely unsuspected threat to the existence of all life in the universe. 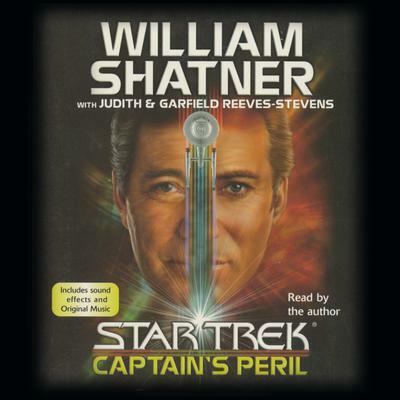 From the breathtaking shores of Bajor’s Inland Sea to the welcoming arms of a seductive and deadly alien commander intent on making Kirk her own, Star Trek: Captain’s Peril spans space and time to present Captain Kirk’s most personal, and most extreme, adventure.